I would have to say that caramel is one of my biggest weaknesses. Besides ice cream. Something about that sweet, gooey deliciousness, I just cannot resist. Caramel sauce over ice cream? I just died and went to heaven. 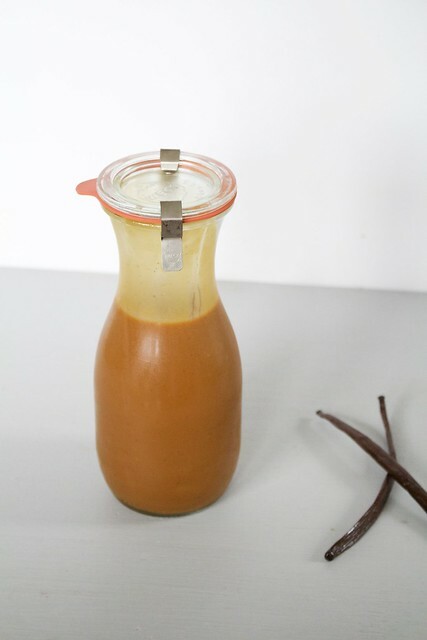 Homemade caramel sauce is a total must. It tastes a million times better than anything store bought. And it is so much more than just an ice cream topper. My favorite treat after lunch lately has been homemade applesauce with a spoonful of caramel mixed in. Delish! This sauce is so good I seriously want to eat it with a spoon. (Maybe I have a little, don't judge.) Mixed in with my coffee for a little extra kick in the morning? Yes please! 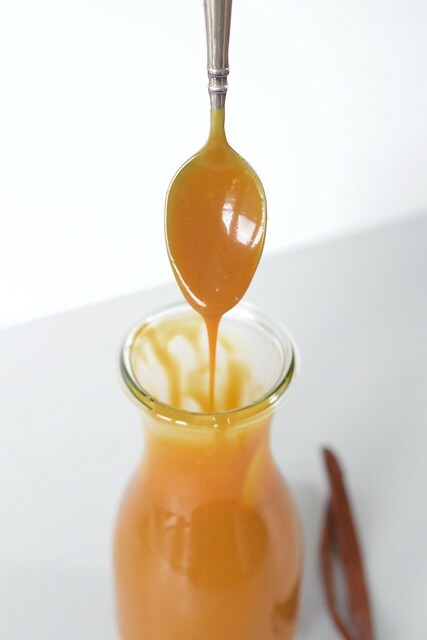 Stay tuned for some recipes using this caramel sauce. Spread the sugar in an even layer over the bottom of a large, heavy-bottomed saucepan. Place over medium-low heat, watching carefully. When the sugar begins to liquefy around the edges, use a heatproof spatula to gently stir it towards the center. Continue stirring very gently until all the sugar is melted. Measure out the heavy cream in a liquid measuring cup and scrape the seeds from the vanilla bean into the cream. Set aside. Once the caramel reaches a deep amber color, immediately remove the sauce pan from the heat. Carefully whisk in half of the heavy cream along with the vanilla bean seeds. The mixture will steam and bubble violently. Stir until the cream is well incorporated, then whisk in the remaining cream. Stir in the salt and the vanilla. If any sugar has hardened, place the saucepan over low heat and whisk until smooth. Store in an airtight container in the refrigerator. If needed, it can be rewarmed in the microwave or in a saucepan over low heat.